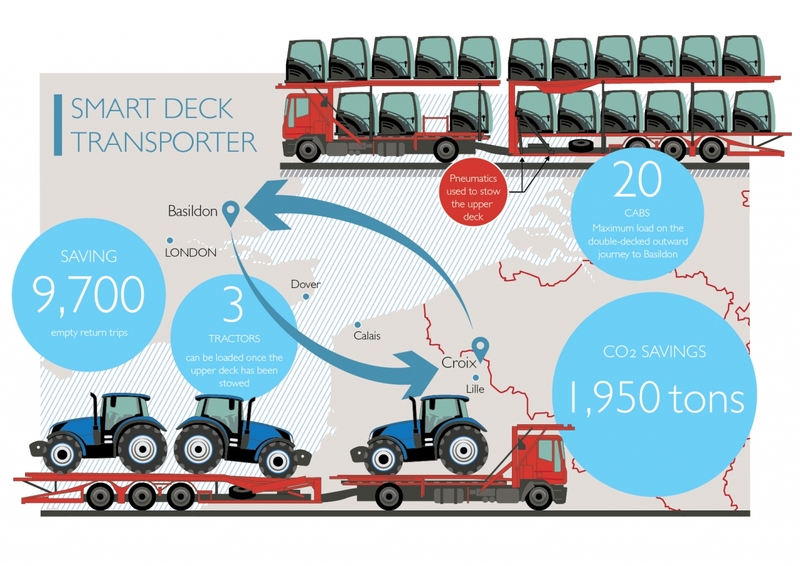 Until 2009, double-deck trailers would deliver consignments of 20 tractor cabs built at CNH Industrial’s factory in Croix, north-eastern France, to the New Holland Agriculture plant in Basildon, UK, where the manufacture of tractors is completed. Because the trailers had top decks that were fixed in place and the finished tractors were too tall to fit, they would drive back to Croix empty. This was the definition of an unsustainable process – and CNH Industrial’s logistics team were determined to put an end to it. Working with tractor transportation partner De Rooy from the Netherlands, they developed a new two-deck trailer with a collapsible top deck that can be raised or lowered at the touch of a button by the driver. When the top deck is stowed, the trailer can accommodate three finished tractors and transport them from Basildon back to France or Belgium for onward global distribution. As the Basildon plant exports some 90% of its production, the impact is significant. After implementing the change at the Basildon facility, in 2011 CNH Industrial was able to replicate this best practice at St Valentin, a Case IH and STEYR tractor plant in Austria. There are now eight double-to-single-deck trucks in the fleet in Basildon and 12 in St Valentin, examples of CNH Industrial’s ambitious World Class Logistics (WCL) program. The introduction of more versatile double-deck trailers at the plants in Basildon and St Valentin are examples of how the WCL program seeks to optimise the flow of parts between suppliers and depots. CNH Industrial has also introduced a number of pilot schemes across Europe, the Middle East and Africa, linking suppliers directly with local depots instead of focusing deployment through master depots, thereby further reducing waste, carbon emissions and the Company’s impact on the environment. This project exemplifies how a local solution can act as a catalyst for positive change throughout CNH Industrial.